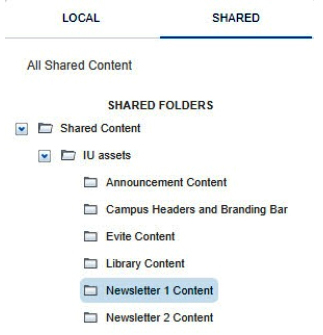 In the Newsletter 1 and Newsletter 2 templates, you can use the preset content regions, change the content region, add content to blank regions, or drag and drop new content areas. Hover over the content region you want to change, and then, in the upper right corner, click the arrow icon and select Delete. Find the content mockup or placeholder you want, and then drag and drop it into your empty content region.